She was housed right next to some of the younger kids and I lay in her pen for a short while to talk to the kids through the gate. Of course, being a goat, she had to come and see what I was up to. She managed to come through the milking parlour this evening without too much noise and kicking - she was pretty well behaved actually. Not sure how long that will last! Wye market was fairly good this morning and the rain held off right until we had packed the last box in the cars at the end. Pretty good timing for a change! For the first time in weeks, I have decided to spend the night at home with Marmite instead of in the caravan outside the barn. 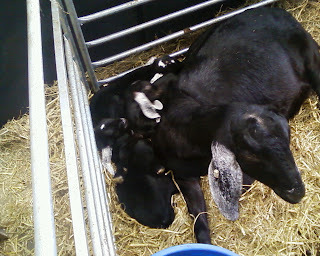 Hopefully everyone will be snug and safe tonight - at least I know that JoJo won't have the chance to sit on her babies! So, that's me done. I'm going to spoil myself tonight and have an early night and sit in bed and read a book - a very rare treat at this time of year. Back in the caravan soon though awaiting ZsaZsa (due Friday) and then Figgie and Patsy the following week.